This question is similar to this, but the apps aren't even starting to update and I don't have the blue dot next to the app name on the homescreen. I have 15 apps available for update on my iPhone SE, but when I attempt to update them, it doesn't work. 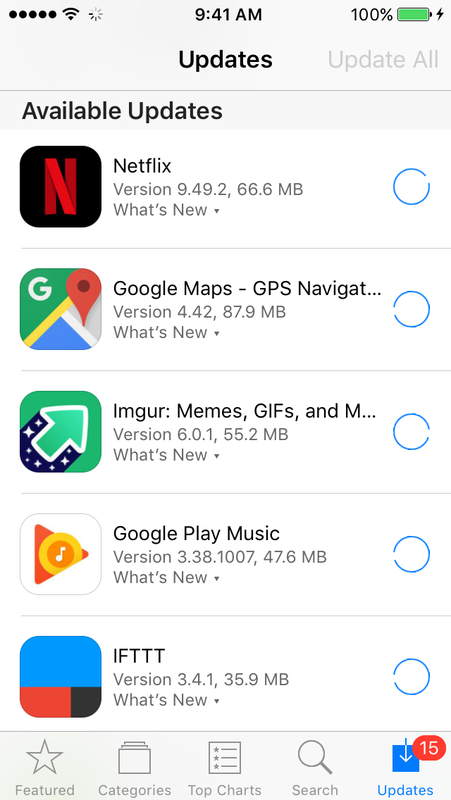 When I try to update apps, the spinning wheels show up but don't change to the ones that show progress. Even after a while the app updates are still spinning. I can still use the apps while this is happening. The "Update All" button also doesn't work properly. Clicking on the spinning wheel just launches the app. When installing new apps I have the same problem. Sideloading apps seems to work fine. Storage space is not the problem as I have more than 1 GB free. I don't have restrictions enabled either. This is a software issue. What I suggest is backing up your iPhone with iCloud backup (Settings -> Your Name -> iCloud -> iCloud Backup -> Backup Now - Unless it has already recently backed up), then make sure you get your wifi password and Apple ID password. ***If your Apple account sends you verification codes all of the time you need to add another number to your account in Settings -> Your name (or iCloud) -> Password & Security -> Edit to add trusted phone number (you wont be able to get the code when you sign back in)>. After you've backed up. Sign out of iCloud, erase the iPhone (Settings -> General -> Reset -> Erase all Content And Settings) and then set up the phone, but restore from the iCloud backup. You'll need wifi, Apple ID account login (and a verification code from another trusted number if your account sends you verification codes). Once thats done the phone will look the same, messages, apps, photos, notes, calendar events, etc. After that, then try to update your Apps. I do not know where you came from, but as you may know, Apple Co., has restricted some coutries from taking new updates and apps. As soon as apple find out your ip is from that specific country, you will be blocked, you will be lucky if apple won't block your apple ID. How to solve this problem? You should use VPN to change your ip to another one from another country.